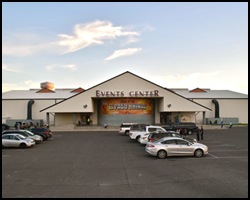 The El Paso County Coliseum is the premier entertainment and sports venue in the Southwest. The Coliseum, which has a seating capacity of 6,500, hosts between 125 and 150 performances a year. The venue hosts a variety of entertainment performers, including Latin heavyweights Luis Miguel and Mana, to pop music superstars Ariana Grande and Ricky Martin, to heavy metal icons Slayer and Slipknot, to Hall of Famers like Green Day, as well as everything in-between, such as the rodeo, circus, boxing, soccer, festivals, dances, roller derby, Disney on Ice, Tuff Hedeman Championship Bull Riding, Oktoberfest, the El Paso Coyotes arena soccer team, the El Paso Rhinos Thorne Cup winning hockey team, the state champion UTEP Miners hockey team and so much more. Originally built to host rodeos, the El Paso Coliseum and Livestock Exposition Building officially opened its doors on May 21, 1942, celebrating its 75th anniversary in 2017. 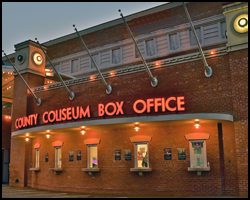 Now known simply as the El Paso County Coliseum, one of the city’s most popular venues has undergone several changes throughout the years, including a major renovation to the facade, box office, the addition of a state-of-the-art heating and air-conditioning system, new seating, expanded hallways, concession stands and restrooms. Promoters and entertainers enjoy comfortable dressing rooms, new staging and the easiest load-in capabilities in the area. The property also features an 850-space parking lot, the Events Center, Judging Arena and the open-air Pavilion. The El Paso County Coliseum is managed by the El Paso Sports Commission under the guidance of CEO and President Brian Kennedy. The Sun Bowl, built in 1963, hosts the second-oldest nationally televised collegiate football game. It's also home to the UTEP Miners football team. 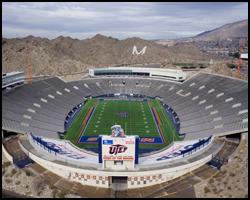 For large venues, the Sun Bowl is equal to many of America's large stadiums, with 51,000 seats and 30 wheelchair spaces. Past performances include The Rolling Stones, U2, Pink Floyd, Ricky Martin, Pace Motor Sports Monster Trucks, two Dallas Cowboys scrimmages and various televised boxing events. It was renovated in 1982, expanding seating capacity to 52,000. Recent additions to the stadium have included a state-of-the-art video board and scoreboards and a Matrix 46 playing surface. More than seven million fans have passed through the Sun Bowl turnstiles. 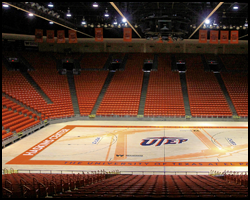 Named after the legendary UTEP men's basketball coach, the Don Haskins Center is among the top basketball facilities in the Southwest and Conference USA. Built in 1976, the Haskins Center features a Robbins Bio-Channel Star maple floor, installed in 2013. The gameday environment for basketball was enhanced in 2014 with the addition of new scoreboards and video replay boards. 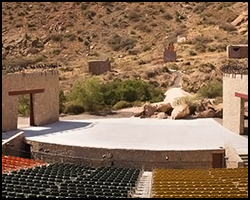 The center is also one of the most flexible performance arenas in the Southwest. It features 12,000 seats, 36 wheelchair spaces and 800 portable seats in the round, and 7,000-9,000 seats with end-stage seating. Acts that have appeared include Santana, Metallica and Aerosmith, among others, as well as the Harlem Globetrotters, the Royal Lipizzaner Stallions, World Championship Wrestling and preseason NBA games. The Don Haskins Center is also used for commencements and graduations. 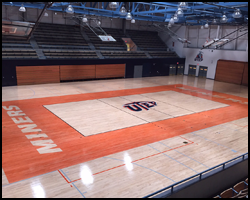 The home of the 1966 NCAA Basketball Champions, Memorial Gym continues to house the UTEP volleyball team since the program's inception in 1974. With capacity at 5,200, Memorial Gym is consistently at the top of the Conference USA standings in attendance, making it one of the best venues in the league. It has also hosted the Conference USA Women's Basketball Championships. It is also used for recreational events. Built in 2014, the park is home to the Triple-A Minor League Baseball's El Paso Chihuahuas. 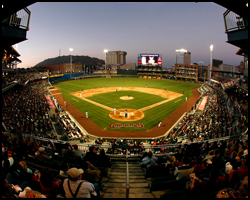 Nestled in the heart of Downtown El Paso, Southwest University Park also offers a unique setting for a variety of events, competitions and functions. The ballpark is situated on a little more than five acres of land and incorporates El Paso's rich history with its unique design. The red brick exterior resembles the nearby Union Depot and includes a box car-like facade and archways along the concourse. Two buildings, the Santa Fe Pavilion and Big Dog House, adorn right field with hospitality areas for parties and individuals alike. 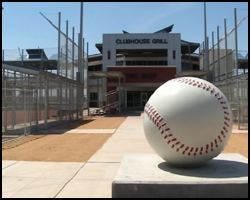 The City Hall Grill, a tribute to what once stood on the site of the ballpark, and Sun Kings Saloon, a tribute to El Paso's baseball past, make up the Big Dog House, while the open air floors of the Santa Fe Pavilion offer 360 degree views of the ballpark and the city. Built in the early 1930s, the track has been home to several All-Americans, national champions, national record-holders and Olympians. 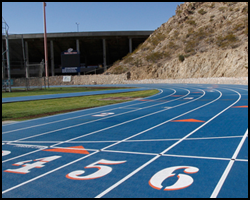 Named after UTEP professor and athletic booster John W. Kidd, the facility was shared with the UTEP football team until 1962, when it became sole home to the track and field team. The track features an eight-lane Mondo Track, the same surface used for the 2000 Sydney Olympic Games, offices, locker room and a student-athlete lounge. The lit facility also houses throws and jumps arenas, making Kidd Field one of the top track-only complexes in the country. The state-of-the-art Daktronics 9x15-foot LED video display plants fans right into the action, providing graphics and video elements that display real-time highlights throughout a meet. The basketball center opened in 2009, thanks to gifts of $3 million each pledged by Paul L. Foster and Jeff and Sharon Stevens. 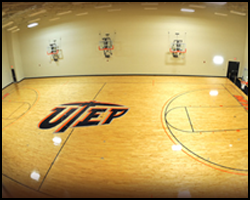 The 43,000-square foot complex features two practice courts, a strength and conditioning center, sports medicine center, academic/film rooms, coaches' offices, locker rooms, equipment room and lounges for the UTEP men's and women's basketball programs. The building is located adjacent to the Don Haskins Center. The entrance to the facility is a shrine to the 1966 Texas Western College national championship team, complete with a large mural depicting highlights from the record-breaking season. 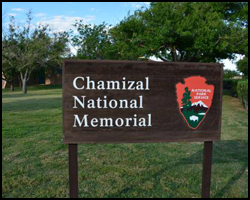 The Chamizal National Memorial is more than just an urban park to recreate or enjoy a quiet afternoon. These grounds are a reminder of the harmonious settlement of a 100-year border dispute between the United States and Mexico. It celebrates the cultures of the borderlands to promote the same mutual respect that helped to diplomatically resolve an international disagreement. The park is host to a variety of events, concerts and visitors. The Sportspark has become one of the region’s premier athletic complexes, with its lighted T-ball, softball and baseball fields. The park can easily accommodate a 200-team tournament, with games played during the day and at night. 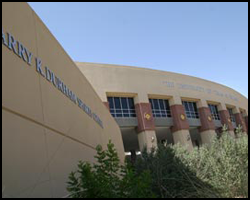 Completed in 2002, the center, named for successful businessman and former Miner football standout Larry Durham, the 65,000-square foot building is situated adjacent to the Sun Bowl. It features a 11,420-square foot strength and conditioning center, a 4,798-square foot sports medicine center and a student-athlete lounge/computer center, which are utilized by all Miner sports. The Hall of Champions, located on the second floor of the complex, honors UTEP's athletic heritage and is utilized for university and Department of Intercollegiate Athletics receptions and functions. The Events Center is a 1000-seat facility with multifunctional capabilities, enhanced by a professional and regulation-size ice rink. It is home to the Tier I Junior A ice hockey team, El Paso Rhinos. It is also home to the UTEP Miners ice hockey team, as well as several local organizations and leagues, which also compete in the rink. The Judging Arena hosts a variety of events, including the Sun City Roller Girls roller derby team and dog shows. The outdoor Pavilion is the ideal location for festivals, concerts and events, such as Oktoberfest and Foam Wonderland. All three facilities are located on the grounds of the El Paso County Coliseum. This scenic canyon park is located on the north side of El Paso and is in the middle of the Franklin Mountains. It is home to the Amphitheatre, which features entertainment shows and movies, and the Pavilion, a reception venue. The canyon itself is an exciting location for hiking and features several trails. Check with our office for tournament and event specials offered by the many outstanding hotels in the El Paso area.